We drove to Whitby for a day out on Halloween, a good place to be on such a day, the scene of the original Dracula story. We had a good day, it was warm and the sun was out, great for the last day of October. At the end of the pier, we even paid the £1.20 each to climb to the top of the old lighthouse (something I wouldn't do before), some good views from the top. It was part of Goth week so there were even more people in costume than would normally be expected at Halloween in the UK. As well as the Goths there were Steam Punks and also lots of Pirates, I know about the Goths and Steam Punks but when did people start dressing as Pirates. 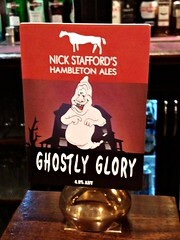 Didn't have a beer in Whitby but we did stop off at the Royal Oak, in Great Ayton and there was a Halloween beer on draught, it was very good, so I had two. Dot was driving after that, the Royal Oak seems to be a very nice and friendly pub. 4.4% deep gold colour with a good head, toffee aroma, mild toffee and hop taste, I got no ginger at all but I did like it a lot. 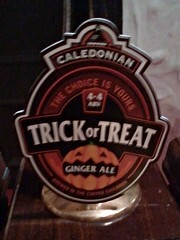 We then moved on closer to home and had another Halloween beer in the Ship at Wolviston. 4.0% deep gold colour with a good head, fudge aroma, some toffee in the taste, nice.